by Stanley I. Greenspan, M.D. Almost every family knows someone, either in their immediate or extended family or in their community, who is trying to meet the challenges of children who are given a diagnosis of autism. For more than thirty years, I have been working on improving the clinical approaches that will best help children and families. The primary difficulties children with an Autism Spectrum Disorder (ASD) evidence are in their capacities to relate, communicate and think. Having had the opportunity to direct a research center at the National Institute of Mental Health, my colleagues and I were able to study human development. We were able to look at many variations, from even before a baby is born up through childhood. Subsequently, I’ve had the honor of working with children of all ages, as well as adults, with these challenges. Over the years, we developed a comprehensive approach built on the insights gained from our studies and clinical work. We describe this model as the Developmental, Individual Difference, Relationship-based (DIR)/Floortime approach. The value of this approach is in its ability to enable us to understand the uniqueness of every child and create a profile of that child. We are then able to enter the child’s world and bring the child into a shared world. In this shared world, the child is able to progress up the developmental ladder and learn in a meaningful way. In its comprehensiveness, the DIR/Floortime approach captures the critical components of human development and puts the family at the forefront of helping their child. Specifically, the DIR/Floortime approach is a framework that helps clinicians, parents and educators conduct a comprehensive assessment and develop an intervention program tailored to the unique challenges and strengths of children with ASD and other developmental problems. The objective of the DIR/Floortime model is to build healthy foundations for social, emotional and intellectual capacities rather than focusing on skills and isolated behaviors. ■ The D (developmental) part of the model describes the building blocks of this foundation. Understanding where the child is, developmentally, is critical to planning a treatment program. The six social-emotional developmental milestones (see Chapter 4) describe the developmental milestones that every child must master for healthy emotional and intellectual growth. This includes helping children develop capacities to attend and remain calm and regulated, engage and relate to others, initiate and respond to all types of communication beginning with emotional and social affect-based gestures, engage in shared social problem solving and intentional behavior involving a continuous flow of interactions in a row, use ideas to communicate needs and think and play creatively, and build bridges among ideas in logical ways that lead to higher-level capacities to think in multicausal, gray area and reflective ways. These developmental capacities are essential for spontaneous and empathic relationships, as well as for the mastery of academic skills. ■ The I (individual difference) part of the model describes the unique biologically based ways each child takes in, regulates, responds to and comprehends sensations such as sound and touch, and the planning and sequencing of actions and ideas. Some children, for example, are very hyperresponsive to touch and sound, while others are underreactive and still others seek out these sensations. “Biological challenges” describes the various processing issues that make up a child’s individual differences and that may be interfering with his ability to grow and learn. ■ The R (relationship-based) part of the model describes the learning relationships with caregivers, educators, therapists, peers and others who tailor their emotionally based interactions to the child’s individual differences and developmental capacities to enable progress in mastering the essential foundations. Central to the DIR/Floortime model is the role of the child’s natural emotions and interests, which has been shown to be essential for learning interactions that enable the different parts of the mind and brain to work together and to build successively higher levels of social, emotional and intellectual capacities. DIR/Floortime is a specific technique to follow the child’s natural interests and at the same time challenge the child toward greater and greater mastery of the social, emotional and intellectual capacities. With young children these playful interactions may occur on the “floor” but go on to include conversations and interactions in other places. The DIR/Floortime model, however, is a comprehensive framework that enables clinicians, parents and educators to construct a program tailored to the child’s unique challenges and strengths. It often includes, in addition to DIR/Floortime, various problemsolving exercises and typically involves a team approach with speech therapy, occupational therapy, educational programs, mental health (developmental psychological) intervention and, where appropriate, augmentative and biomedical intervention. The DIR/Floortime model emphasizes the critical role of parents and other family members because of the importance of their emotional relationships with the child. Parents have a unique opportunity in this book to gain insight into the model as it was envisioned. Dr. Ricki Robinson is the embodiment of a clinical practice true to the DIR approach in the hands of a warm, caring and seasoned clinician. She has been a valued colleague of mine and a keen supporter of the Interdisciplinary Council on Developmental and Learning Disorders (ICDL) initiatives since the early 1990s. She is extremely well trained and considered an expert in the field of pediatrics as well as in the clinical practice for children with ASD. She is a sought-after worldwide lecturer on this topic and an untiring educator for parents and professionals devoted to these children. Her warmth and engaging personality come through these pages as she guides parents and professionals on their treatment team through the multistep evaluation that informs the correct treatment approaches for their child’s individual sensory-motor profiles, as well as solution-oriented suggestions to solve the many challenges, both developmental and medical, facing children with ASD and their families, especially as their child grows and develops. Dr. Ricki, as she is known by the children and their families, is one of those rare individuals that both in her practice and in this book provides the full package, including the often elusive medical component. With all the controversy surrounding potential medical treatments in a comprehensive program, Dr. Ricki helps us understand the potential medical contributions and when they need to be considered. The wonderful case studies and the beautiful description of the DIR/Floortime model, coupled with the extremely thoughtful and comprehensive discussion of medical concerns, makes this a must-read for all those interested in or struggling with a youngster with an Autism Spectrum Disorder. RICKI G. ROBINSON, M.D., M.P.H. Dr. Ricki, as she is known by the children and their families, is one of those rare individuals that both in her practice and in this book provides the full package, including the often elusive medical component. With all the controversy surrounding potential medical treatments in a comprehensive program, Dr. Ricki helps us understand the potential medical contributions and when they need to be considered. Dr. Ricki's warmth and engaging personality come through these pages as she guides parents and professionals on their treatment team through the multistep evaluation that informs the correct treatment approaches for their child’s individual sensory-motor profiles, as well as solution-oriented suggestions to solve the many challenges, both developmental and medical, facing children with ASD and their families, especially as their child grows and develops. Dr. Ricki Robinson is the embodiment of a clinical practice true to the DIR approach in the hands of a warm, caring and seasoned clinician. 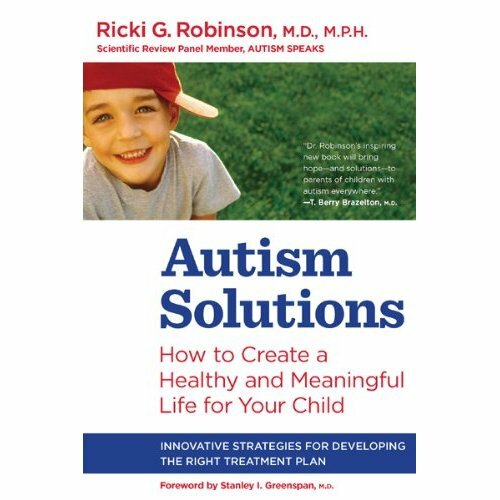 Dr. Robinson is extremely well trained and considered an expert in the field of pediatrics as well as in the clinical practice for children with ASD. She is a sought-after worldwide lecturer on this topic and an untiring educator for parents and professionals devoted to these children.